Dillon Johnson led off the 10th inning with a double and scored on a one-out balk, giving UNLV an 11-10 win over Loyola Marymount in the Marucci Desert Classic baseball tournament Sunday at Wilson Stadium. Dillon Johnson led off the bottom of the 10th inning with a double and scored from third on a one-out balk, giving UNLV an 11-10 victory over Loyola Marymount in the Marucci Desert Classic baseball tournament Sunday at Wilson Stadium. Johnson was sacrificed to third and, after two straight intentional walks, scored on a balk by Codie Paiva. Nick Ames hit two two-run homers, and Nick Rodriguez’s three hits included a two-run shot and a double for the Rebels (3-0), who overcame a 5-0 first-inning deficit and a 9-6 hole in the fourth. Ryan Ruley hit a three-run homer in the Lions’ five-run first inning and Niko Decolati a two-run shot in their four-run fourth. 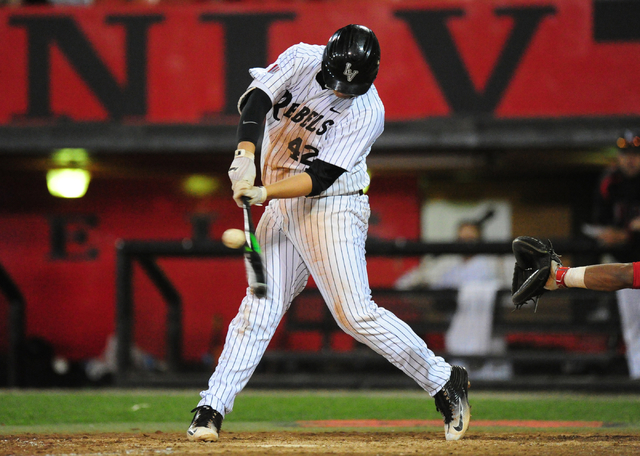 Vince Taormina put UNLV up 10-9 with a solo home run in the fifth. But Loyola Marymount (0-3) tied it in the seventh on Niko Pacheco’s RBI triple. Grant Robbins went 3-for-5 with a double and an RBI, and Kyle Isbel had a triple and a double and scored twice for UNLV, which had a 15-13 edge in hits. At Eller Media Stadium, Janine Petmecky hit a two-run triple to back Charlie Masterson, who allowed two runs in six innings of relief, rallying the Rebels to a 7-5 victory over Seattle in the Marucci Desert Classic. Masterson (3-0) entered in the second inning after freshman Devynn Marshall gave up three runs, on homers by Madison Cathcart and Savannah Loomis, in the first. UNLV (8-2) tied it at 3 in the bottom of the first, thanks largely to Petmecky’s hit, and went ahead 6-3 in the second. Mia Trejo and Alyssa Navarro each went 2-for-3 for the Rebels, with Trejo driving in a run, and Justine Federe scored twice. Cathcart and Loomis had two hits apiece for the Redhawks (6-4), who held a 10-7 edge in hits. At Fertitta Tennis Complex, the men’s match against Oregon and the women’s match against Wisconsin were canceled because of high winds, the university said.